Lachlan Bailey reunites with model Patricia van der Vliet for the April edition of Vogue Nippon where glamour and grunge collide. 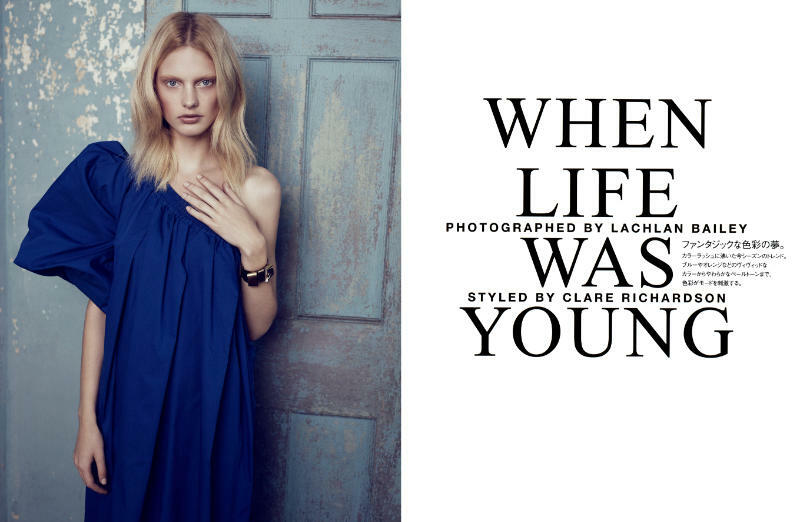 Capturing vibrant seventies inspired garments styled by Clare Richardson, designs from labels such as Miu Miu, Christopher Kane and Emilio Pucci take center stage in When Life Was Young. Pat can do no wrong. She gets better and better. Simple, natural and classy.. Like it ! i find that this whole thing is lovely, lovely colors, setting, model, clothes. I’ve fallen a little in love with this editorial. Whimsical and romantic, it is very moving. Beautiful, soft and delicate. I love Lachlan’s style with Patricia’s beauty. I much prefer this Vogue Nippon to the tackier side we sometimes see. hmm not feeling it as much as everyone else, everything is nice but its just that… its just a safe feeling editorial, nothing new and not done amazingly, patricia looks good though! beautiful crumbling walls. So pretty! Its a bit safe, but you gotta admit, the way it showcases the clothes is beautiful. Just look at that blue Pucci dress. Its perfection. Every aspect of this is wonderful. Maybe it’s a little break from the action, but that’s nice sometimes, too. I love Lachlan Bailey , Lachlan If you’re reading this – i love you !!! this isn’t even his best work but even so – he just ‘gets’ color right every single time .